What Day Of The Week Is December 6? 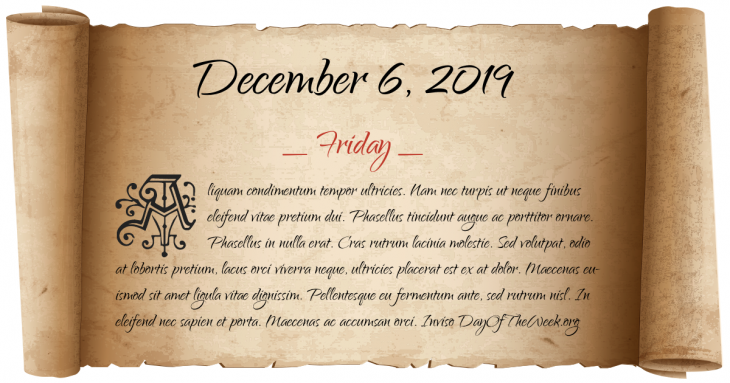 December 6, 2019 is the 340th day of the year 2019 in the Gregorian calendar. There are 25 days remaining until the end of the year. The day of the week is Friday. Béla I of Hungary is crowned king of Hungary. Colonel Pride of the New Model Army purges the Long Parliament of MPs sympathetic to King Charles I of England, in order for the King’s trial to go ahead; came to be known as “Pride’s Purge”. The U.S. Congress moves from New York City to Philadelphia, Pennsylvania. The Washington Monument in Washington D.C. is completed. World War II: The United Kingdom declares war on Finland in support of the Soviet Union during the Continuation War. Spain approves its latest constitution in a referendum. The École Polytechnique Massacre (or Montreal Massacre): Marc Lépine, an anti-feminist gunman, murders 14 young women at the École Polytechnique in Montreal. The Canadian province of Newfoundland is renamed Newfoundland and Labrador. Who were born on December 6?